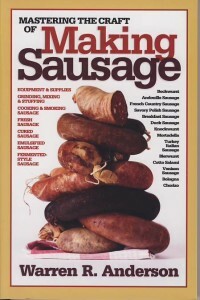 The author of Mastering the Craft of Smoking Food here offers a comprehensive guide to making sausages of all kinds: beef and pork sausages, cased and uncased, sausages from poultry and game, emulsified sausage, cured sausages, fermented-style sausages and more. Complete instructions are provided for grinding meats, stuffing, curing, and storing sausage. Other chapters cover equipment and supplies, food safety, and techniques for cooking and smoking sausage. Sausages include bratwurst, Vienna sausage, luganega, kielbasa, chorizo, salami, and many others—100 different sausage recipes in all.